For the fourth year running, we’re thrilled to be partnering with Pashley, who are furnishing both of our troupe with their beautiful and robust Pashley Pathfinders. We’ve got them in burgundy (a one-off just for us! ), and with all the special features to ensure our troupes safely and smoothly cover the length and breadth of Britain. Pashley hand-builds a unique range of cycles in Britain; it is England’s longest established manufacturer of bicycles and only 1 of 3 remaining in the UK (the others being Moulton Bicycles and Brompton). Pashley were founded in 1926 by William ‘Rath’ Pashley, and are based in Stratford-upon-Avon, Warwickshire – birthplace of one William Shakespeare – situated on the edge of the renowned Cotswolds, in the Heart of England. So we couldn’t dream of a more perfect bicycle partner! The frame is traditionally made using a fine-lugged construction method and specially selected Reynolds lightweight butted steel tubing to ensure great strength and durability. Steel is able to withstand the repeated stress typically placed on a bicycle frame, more effectively than alternative frame materials. 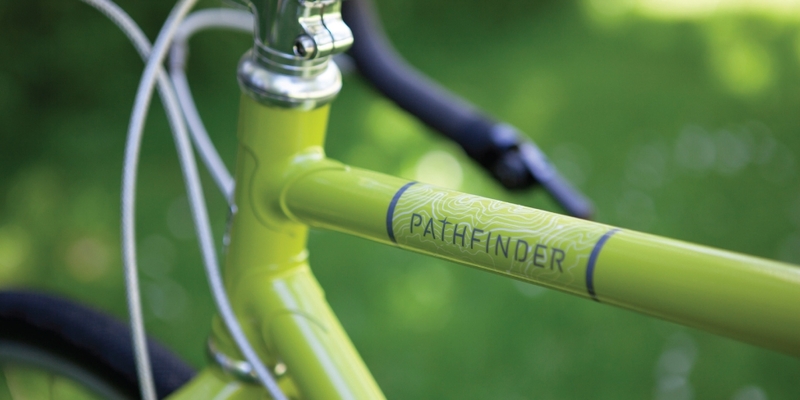 In addition, the Pathfinder has been built using a traditional cycle manufacturing method with lugs. 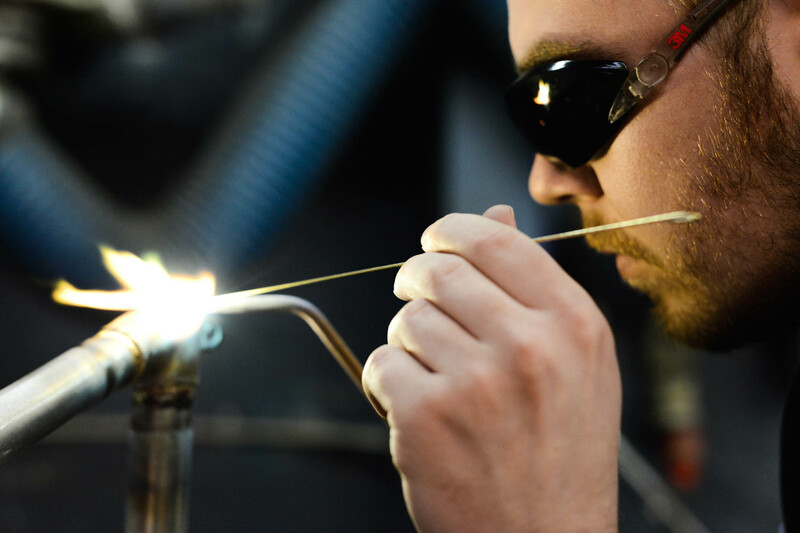 This is a slower, hand-crafted process done at a lower temperature to the more modern and quicker TIG method, so less stress is produced in the frame. The lugs also add additional strength to the frame joints, overall producing a robust yet refined frame that will provide many years or service. In addition, if we ever want to switch to a derailleur gear system, the frame has all the necessary braze-ons required. The comfortable compliance of the Pathfinder’s steel frame is ideal for long distance riding. Although steel is sometimes regarded as ‘old-fashioned’, it is actually an excellent material for building bicycle frames and for giving a lively, yet comfortable ride. This will be appreciated as we will cover long distances in the saddle, and having a sprightly quality to our bicycle frames will be preferable to the somewhat ‘dead’ feel of other frame materials such as aluminium. Features a full complement of braze-ons for carrying both front and rear luggage racks. Mounting points are provided for a four point rear pannier carrier and a low rider (fork mounted) front carrier so there is plenty of carrying capacity for our kit whilst on tour. The bicycle also has mounts for mudguards and two bottle cages. Gear mechanisms are not exposed to dirt or weather so require minimal maintenance. An enclosed gearing system makes for virtually maintenance free riding and flawless gear changes unaffected by mud and grit, so hopefully there will be little to hinder us whilst we are on the road. The versatile Shimano Alfine 8 speed gear, with its effortless operation, will allow us to ride the roads with pace and equally tackle the toughest of Britain’s climbs. Disc brakes that provide more consistent performance than rim brakes in wet weather conditions. 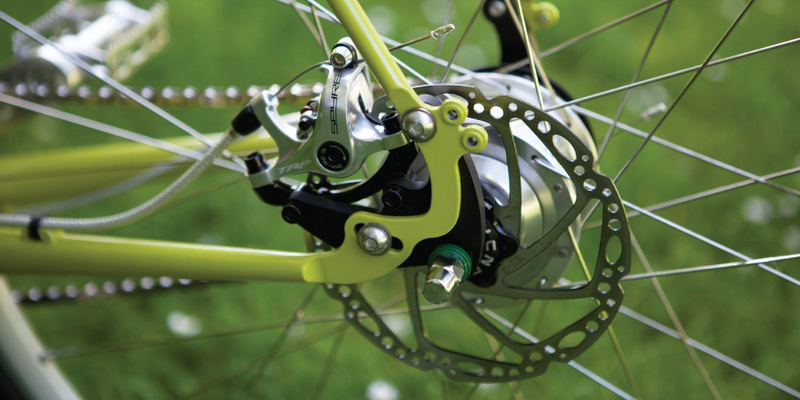 Regarded as the best in their class, the Pathfinder bicycle’s TRP Spyre disc brakes use dual-piston cable actuation providing an even and precise braking force. This translates into even pad wear and, with a simple cable barrel adjuster, the pads can be adjusted easily and hassle free. The disc brakes provide consistent braking in all conditions (are less affected by wet weather/mud); vital to us for predictable braking, especially when loaded for touring. Provides stability when loaded with luggage and a comfortable, more upright riding posture. The long wheel base of the Pathfinder bicycle offers comfort and stability when loaded with our panniers, and the steering geometry provides predictable control over rougher ground. Its front fork has a large tyre clearance which, together with an extended headtube, makes for a more upright and comfortable riding position whilst still retaining the classic horizontal top-tube design. Reduces the likelihood of punctures and increases tyre life. The Pathfinder uses a very durable Gatorskin tyre. It features an internal polymide mesh and polyester ‘breaker layer’ directly under the tyre surface, providing superior puncture resistance; we will be able to worry less about grit, gravel and glass with such protection. In addition, the slick natural rubber tread is designed to perform exceptionally in wet or wintery conditions. It is also a big volume tyre which allows for a smoother ride – ideal for Britain’s country lanes. FANCY GETTING YOUR HANDS ON ONE OF THESE BEAUTIFUL BICYCLES? Visit the Pashley website now!